Painted live at Creation Fest UK. It was quite a journey as I painted it, as the spotlight kept going out and I painted it mostly by headlamp with a skewed sense of the colors. Throughout the evening I covered the entire canvas with paint about 3 times, with the sky being completely orange at one point. Painted with palette knife, a lot of paint on this canvas. I felt that this sailing scene was representative of the church in England. 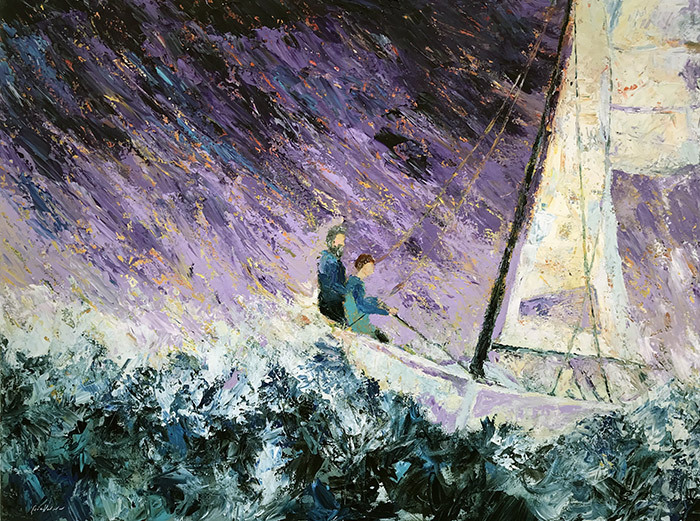 An older man was teaching a boy to sail, passing down his passion to a new generation. An old saltiness was being revived. I was told later that there is a legend in Cornwall (where this was painted) that Jesus sailed there with Joseph of Arimathea, which is interesting.